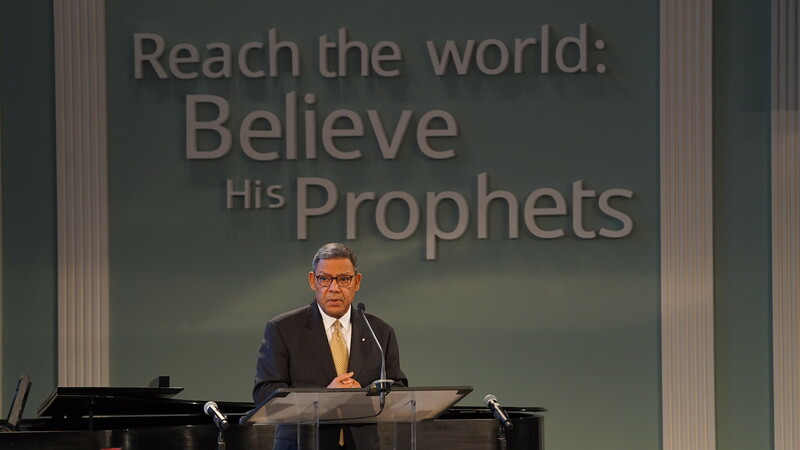 For the General Conference of Seventh-day Adventists Treasurer Juan Prestol-Puesan, the total gross amount of tithe in 2018, a record-breaking $2.5 billion, was thus, the church’s biggest story of the year. Tithe went up $89 million, or 3.6%, he told the Church’s Executive Committee at their Spring Meeting. The increase in the United States was particularly dramatic. It went from $1.022 billion to $1.077 billion. Mission offerings worldwide were also up to $88.3 million, although where the increase occurred was the reverse of the tithe story. The U.S. mission offerings were flat, but they went up in the rest of the world. Tithe is now also one of the most hotly debated topics in administrative circles, following the 2018 vote by the North American Division Executive Committee to discuss with the General Conference how parity in tithe percentages sent to the General Conference can be accomplished. Currently the NAD sends about 6% of tithe, while the other divisions send 2%. Prestol-Puesan did not mention the ongoing negotiation about tithe percentages in his report on Tuesday, April 9. Looking forward to 2019 and 2020, he did say the (NAD) tithe percentage would decline according to policy to 5.85% at the end of 2020. But that is the percentage that was scheduled before the NAD vote. There were no questions following his presentation. Perhaps that was in recognition of the ongoing negotiations. The General Conference and Division Officers had met on Monday evening before the start of Spring Meeting, but failed to come to agreement. That committee met again on Tuesday evening. Plus, the presidents were called to a third meeting on Wednesday. But there was still no resolution. One of the committee members said that the only thing all of them could agree upon was that all parties were not happy. Annual Council is the designated time in church policy to deal with changes in tithe. This year the meeting will take place October 10-16. Luckily, the Stewardship Department report did not immediately follow his prayer. When it was their turn at the microphone, they shared materials they had prepared to help the younger generation become active tithe payers. God First is a stewardship video series prepared for millennials that comes with materials for group activities before watching the video. In the copies of the quarterly magazine Dynamic Stewardship that were distributed there was also an ad for the Pathfinder’s Stewardship Honor developed by the NAD Stewardship Ministries that will be offered at the 2019 International Pathfinder Camporee in Oshkosh, Wisconsin. Perhaps the most surprising aspect of the Spring Meeting was the aborted discussion of the “Reconfiguration of the Northern Asia-Pacific Division and Attaching the Chinese Union Mission to the General Conference.” Live-streaming was stopped for this item that was scheduled for two hours of discussion. But the first commenter pointed out that such realignment of territory, according to the Working Policy, could only be made at Annual Council. A recommendation for the proposed change was voted to be taken to Annual Council. In the other reports during the Spring Meeting, division leaders were reminded of upcoming deadlines for activities tied to the 2020 General Conference Session such as the Strategic Plan for 2020-2025 and the rollout of the Adventist Encyclopedia. Jim Howard, associate director of the General Conference Department of Sabbath School and Personal Ministries, presented a plan for the next phase of Total Member Involvement (TMI). He said TMI 2.0 will go deeper into every local church and broader to sponsor a worldwide evangelistic effort. There were receptions in two newly renovated office spaces: Adventist World Radio and the Office of Archives, Statistics, and Research. Remodeling continues as the space left vacant when the North American Division moved out of the building is being utilized by other departments and agencies. Reports on two new training programs were given. A Community Services and Urban Ministries Certification Program has been developed in a unique collaboration between ADRA and Sabbath School and Personal Ministries. Input from many organizations was sought according to May-Ellen Colon who said the program has now been offered in 11 divisions. Recently, the curriculum was put online through the Adventist Learning Community. She talked about community services as preparing the soil for other evangelistic efforts of the local church. sponsored by the General Conference. It is a post-master’s level program with half of the credits transferable to a doctoral program. The plan is to offer the three-week intensive on four different Adventist university campuses. The first will be at Adventist International Institute of Advanced Studies, the second at Peruvian Union University, the third at Adventist University of Africa, and the fourth at Polish College of Technology and Humanities. Image: Juan Prestol-Puesan delivers the Treasurer’s Report at the 2019 GC Spring Meeting. Image courtesy of Flickr.com / Adventist News Network. Editor's Note: This article has been updated. The increase in United States giving has been corrected. It increased from $1.022 billion to $1.077 billion. (It previously stated $1.22 billion to $1.77 billion.) The name of the Associate Director of the Sabbath School and Personal Ministries Department has also been corrected. It is Jim not Ron Howard We apologize for the errors.